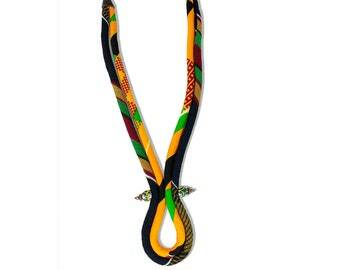 Announcement Houston, TX and online based African jewelry, African inspired jewelry, and natural hair accessories. 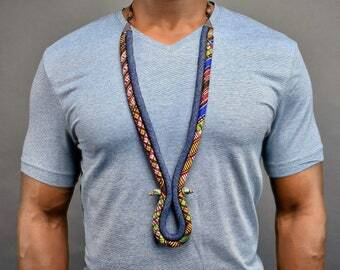 Handmade mixed media/wearable art accessories and jewelry primarily made with African prints, kente, aboriginal prints, batiks and vegan Lether. - Express shipping available - message us for more details. - Wholesale discounts are available on large orders, message us for more info. 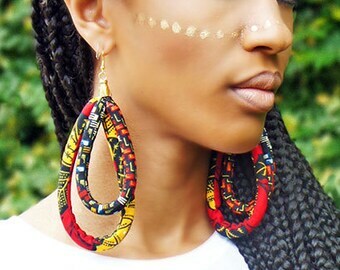 Houston, TX and online based African jewelry, African inspired jewelry, and natural hair accessories. 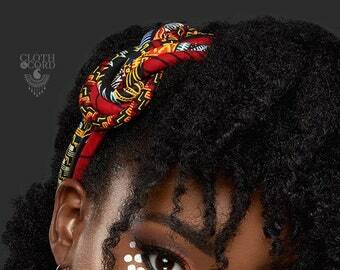 Handmade mixed media/wearable art accessories and jewelry primarily made with African prints, kente, aboriginal prints, batiks and vegan Lether. 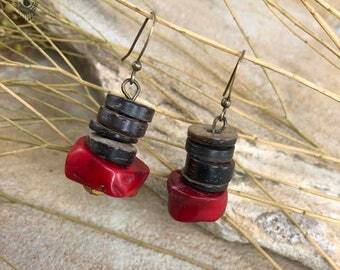 Loves styles button earrings so colorful. I love it! I get so many compliments. It’s so unique and very masculine. 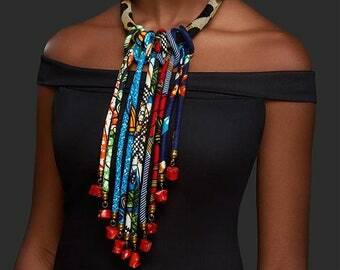 New thin corded African print necklace ! 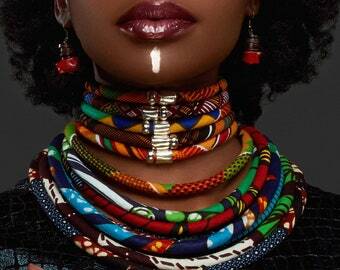 African inspired bold statement jewelry made with unique inspiring fabric! 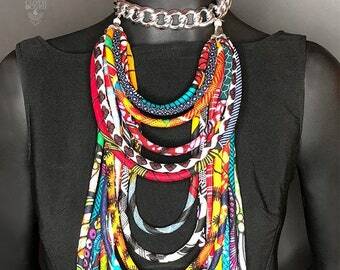 Cloth and Cord, formerly E. Turner Couture, creates and sells handmade bold statement accessories and jewelry by use of fabric manipulation and combining sewing techniques with traditional jewelry making techniques. 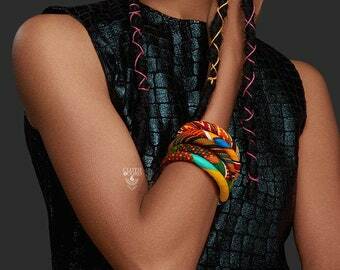 The company was born out of a love for unique prints, sewing, quality craftsmanship and an affinity for unusual statement pieces. I stand behind my product. If you have any problems with your purchase, please contact me and I will do my best to correct the issue. If by chance you are not satisfied with your purchase please contact me within 5 days of the delivery date and you will be offered an exchange for that product in the same price range or I will make edits to your current item. The buyer is responsible to pay for all shipping fees. If you wish to cancel your order this must be done within a 24 hour period, after this time your order will have been started to be made and therefore cannot be cancelled. All items are nicely packaged and we are happy to ship straight to the giftee with or without a gift receipt and add a note on your behalf, just leave the info in the note to seller @ checkout. *"Time to ship" are business days (M-F) and do not include the weekend. Each item has a "time to ship" or processing time, check the shipping page for the time frame on each of your items. *If you need express shipping, please message me before purchasing to ensure I can meet your deadlines. USPS Priority Mail has a delivery time of 2-3 days. USPS Ground First Class has a delivery time of 4-6 days. All US shipping labels include tracking numbers. Delivery time depends on the country - usually 7 - 16 days, although customs can occasionally delay packages further. Once the package has been shipped and is in the possession of USPS, actual delivery time is dependent upon USPS and is out of Cloth & Cord's control. International buyers are responsible for all customs fees, taxes, tariffs, or receiving fees incurred. Buyers are responsible for knowing and abiding by any import restrictions to their country from the US. If your order is needed by a specific time and you have any concerns, please message us through Etsy messaging before purchasing the item to ensure the time to ship + the delivery time will reach the final destination in your expected time frame. Please make sure you have the correct address on your Etsy & Paypal account. Very large wholesale or bulk orders will generally take 3+ weeks, please contact us for an exact estimate. *For custom wholesale orders,I require 50% of the balance of your total order as a deposit.This deposit amount is non- refundable. The second half of your payment is due in full before I ship your order out.